In soil, aeration refers to the extent of air gaps. Soil aeration is the process of using mechanized or manual equipment to either puncture the soil with spikes (spike aeration) or remove approximately 1″ x 2″ cores of soil from the ground (core aeration). 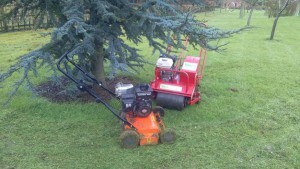 Aeration may be overlooked when trying to restore a lawn but is vital to bring it back to health. It improves drainage and reduces puddles formation. Spike aeration involves the use of an aeration machine with spikes up to a foot or more in length. It is sometimes used to address drainage issues in areas with turf. Core aeration is done on turf areas as a means of reducing turf compaction, reducing thatch buildup, improving the infiltration of water/nutrients, encouraging deeper roots, and creating an environment where grass seed can have direct contact with the soil. There are many types of lawn aerators including walk behind models, ride on versions and tractor pulled versions, as well as spiked shoes. Lawncare-4u uses a mechanical aerator, which presses steel tines into the lawn through to the root zone underneath. Soil and weather conditions permitting it can be done any time of year.